Did they chop down the whole tree to get those bananas? because thats what it looks like. How long does it take to grow a banana tree anyway? Dan, Jason could you elaborate? 1 Kg of bananas?? That's nothing! A good banana's gonna have some weight to it! I order greenies online and I'm constantly surprised the 1 lb is, like, 2 bananas. Kenton: It's mostly the green cooking bananas so the peels are not as slippery. But you could still easily trip over them and fall down. Which would be hilarious in it's own way. Keri: After you harvest the bananas the female part of the plant dies on its own. Seraphina: Yeah. But some tribes don't even eat bananas so you have to eat double to make up for those guys! It's a LOT of bananas. Mostly cooking bananas are like potatoes. They have boiled banana stew with tomatoes and chittlins for breakfast. Then for lunch and supper they have bananas mashed together with some gravy. And afterward they drink banana beer and sit around the fire singing songs about bananas and how much they like to eat them. 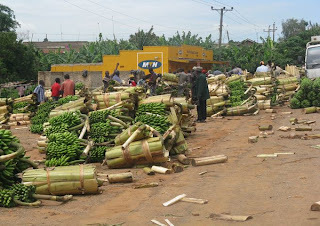 In central Uganda we eat *PLANTAIN* not banana! Locals mistakenly call it banana in English but it's not. And it's not that strange either. Plantain is a staple in parts of Asia, Latin America and the Caribbean! In America we tend to simplify English. For example, in England tortoises live on land and turtles live in the water, but in America everything is just a turtle. Both plantains (cooking bananas) and dessert bananas (sweet bananas) are from the Musa genus. There are over a thousand types of plants in the Musa genus. Scientists typically divide them into four categories. 4) Plants that serve no purpose. In America, we would just call them all bananas. For example, here is a conversation I had with my brother Noel. Noel: Did you know those flowers over there are actually a kind of banana? Me: No. I was not aware. Noel: Yes. Look at those little yellow things. Those are banana fruit. Me: Can you eat them? Noel: Those are decorative bananas, so probably not. I don't know if they are poisonous. I fed some to Jason's dog so we'll find out. Let's test it tomorrow to see what they taste like. However, it's important to make you readers aware of the distinction when saying things like "The average Ugandan consumes 1 Kg of bananas per day". This is very easy to misinterpret, as evidenced by some of the comments from your readers. Unaware that you're talking about a completely different variety used for cooking a staple dish much like mashed potatoes, many readers will undoubtedly think Ugandans spend all day eating the sweet variety found in western supermarkets, which is clearly not the case. Much as you tried to clear it up in the comments, if in the first place you said "a type of banana known as plantain", readers will know that you're talking about something they might not be familiar with and look it up. Simply saying, "1kg of banana's per day" is very misleading.